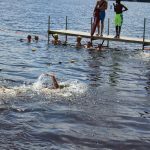 A tradition that goes back many generations, once a summer North Star gets together with Camp Nebagamon for the Bi-Camp Meet. This is one of the great opportunities for our two camps to come together to spend the day participating in many great events. 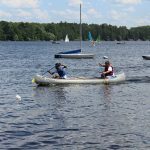 The Meet rotates between the two camps and the events provide an opportunity for our campers to put into use the skills they’ve learned throughout the summer. 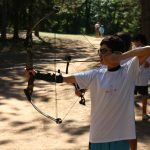 Events that comprise the Bi-Camp Meet include swimming, canoeing, sailing, tennis, archery, riflery, cross country, chess and photography. 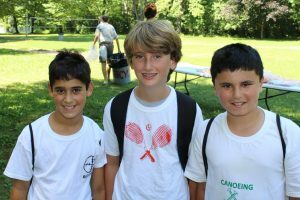 Campers are encouraged to participate in events that they show skills in and enjoy. Each activity area has tryouts and campers are selected to compete against other campers in their same age grouping. Bi-Camp is yet another opportunity for our campers to participate, try their best and display great sportsmanship. There is no overall winner crowned at the end of the day however we know our campers take pride in their accomplishments. There are two other notable inter-camp events. 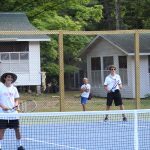 During the first session North Star will take a group of tennis players to Nebagamon for the Northwoods Tennis Tournament, which involves several area camps. We also take a group of our climbers over to Birch Trail during the second session for an event on their climbing wall.